Eyebrow is important before you start with any eye-makeup look. This is how the 1028 eyebrow definer looks like. I comes in a pencil type eyebrow which I like it because it is easy for me to draw my eyebrow. It has dual-end where you can get the pencil type and spolie. It is a Longwear Eyebrow Definer taht helps you to create your desired eyebrow shape because the tip has the shape of rhombus pencil type. 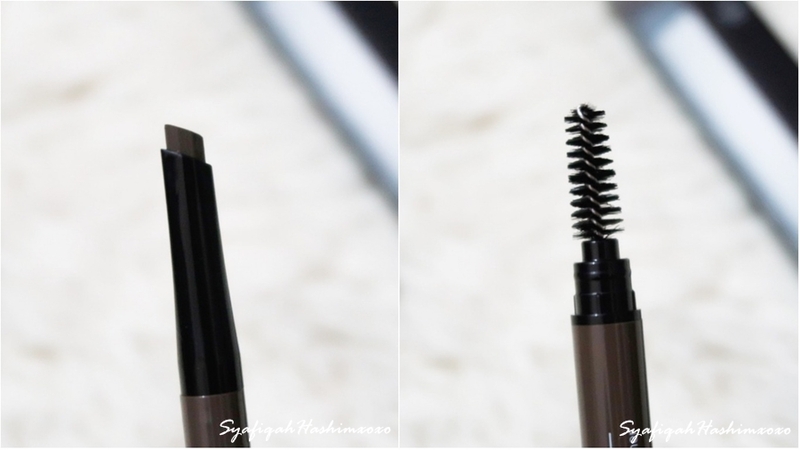 and the spolie/brush on another tip helps to groom the brow evenly to achieve a natural looking-like eyebrow. I really like this eyebrow definer and I even bring this along with me when traveling. It is easy to use and the color match-well for my eyebrow color. I really like the tip of the eyebrow pencil because it makes my drawing much more easier and I can easily achieve the eyebrow shape that I desired. Plus it also have the spolie/brush where I can blend the color and groom my brow accordingly. Next, we move on to the eyeshadows parts where it called as Macaroon! This is how 1028 Macaroon Eyeshadow Kit looks like. It comes in a tin-kinda packaging with beautiful cover to it. On the inside parts it as a small mirror with 6 different shades of eyeshadows. It also have a small applicator in it. This is how the 6 shades looks like. You can tell from the shades that it is more like a sugary sweet-earth-tone eyeshadow. I really like it! The shades is so my style. The basic about this eyeshadows is for you to create a sweet and gorgeous makeup look. This is the swatches for each shades. As you can see, all eyeshadows comes in shimmer finish. Here some pictorial of me apply the eyeshadow. FIRST: Start with using the PINK shades as the based and apply it all over eye lid. THIRD: I apply the DARK BROWN color at the crease to deepen the eye look. FOURTH:Apply the ICY-WHITE color on the brow bone. And the eye look using 1028 Macaroon Eyeshadow Kit is done! Overall, the eyeshadow will last a little longer if you use eye primer to ensure the eyeshadow does not fade away because if you apply it without primer the eyeshadow esily fade away and only the shimmer will last. If you like a korean eye makeup look with effect of shimmer this is for you! But if you're looking for something matte and pigmented you might not like this. After that, Eyeliner! An eye-makeup will not complete without eyeliner. This is how the packaging looks like. It comes in a black with gold look. It comes in a pen type which my favorite with an improved formula of super saturated black pigments. It delivers the most intense black color. It claims that it is an innovative technology of three film-forming polymers forming a protective film that creates a ultra and unbelievable waterproof, smudge proof and double long wearing eyeliner. It is the best to shake it before use so you get the ultimate black color. I really like the ultra-thin felt tip because it help me to create a precise line especially if I want to make an winged-liner. It last quite impressive on my eyeliner. I really like it. I also bring this along during my travel or when I go out. I like how it is easy to use and the color is super black! Lastly, an eye-makeup will look even mesmerizing if you apply mascara ! It has pink and black combination for the packaging. The size is roughly the same as any other mascara size. and the color is black which perfect for everyone. This is how the bristle looks like. I really like it because it make my mascara application easier. It is actually specially designed hook brush that helps to coats every single lash from roots to tip. BEST! In this mascara it has innovative anti-oil, long wearing formulation that gives you a smudge-proof, clean eyelash make up look all day. I really like the formulation where it can keep my eyelash looks longer whit no-clump! Oh yeahhh~ . It contains also contains Vitamin B5 for repairing daily lash damage while strengthening eyelashes. COOL! This mascara last quite good on me yet it is also easily to be romoved with using a warm water. Simply sweet and gorgeous, I apply a pink liquid lipticks to match with the Macaroon vibe. If you want to try 1028 Visual Therapy products you can find them at Selected Watsons in Malaysia. I hope you like my review and mini pictorial of this Macaroon Makeup look featuring 1028 Visual Therapy products. Indeed! the powder nails it..
Well, I think it is good for those who love shimmers eyeshadow.